Before you set to cleaning your brass, make certain that what you are cleaning is indeed made of brass. Go to the kitchen sink and get to work. 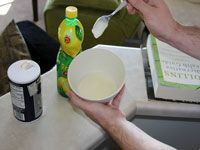 In a non-aluminum pot, boil water with a couple teaspoons each of baking soda and washing soda. Create your own brass polish. Make sure you removed all the tarnish and get your brass good and dry. Protect your brass and make it shine. Brass is an alloy (a mixture of metals) made from melting copper with a small amount of zinc (usually 10–40% of the final product). This alloy has become very popular due to its strength, beauty, malleability, resistance to corrosion, and its ability to hold up against extreme temperatures. It’s also quite forgiving in the casting process. If a mistake is made during casting, it’s relatively easy to melt it back down and try again. For these reasons brass is understandably quite popular. The ancient Romans were probably the first to make and use brass extensively. They used brass to make coins, jewelry, decorations, and adornments for armor. Due to its anti-corrosive properties, it was later used in ship production for its ability to hold up against water and salt. With all this in mind, it’s no small wonder that brass is still so widely used today. 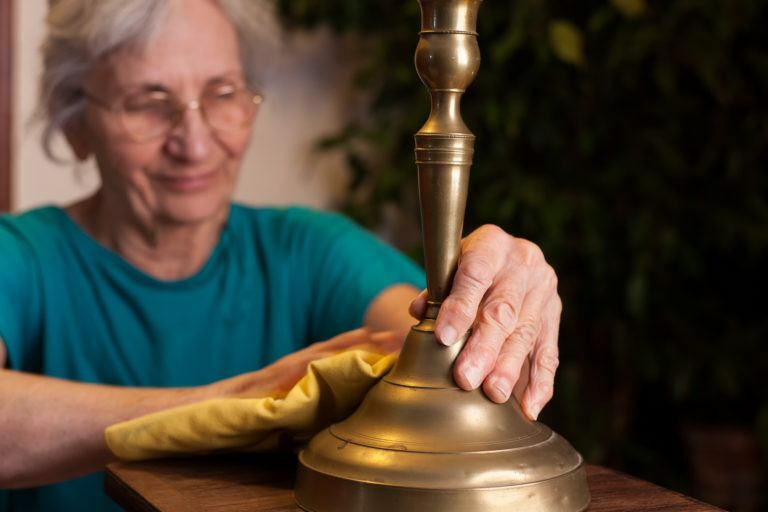 Nowadays, it’s used in everything from wall clocks to trim around a fireplace to statues. 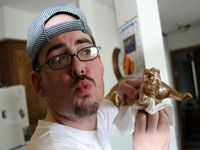 When it comes to cleaning brass—be it an ancient Roman artifact or, I don’t know, a doorknob—people get flummoxed. It’s a beautiful metal, and the last thing you want to do is cause any damage to it. Luckily, it’s easy as all get out to do and to do it naturally. There are numerous brass cleaning methods that use nothing but non-hazardous kitchen ingredients and, depending on the method and the amount of tarnish, a little elbow grease. 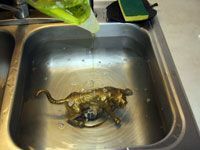 In this article, I will fully cover my preferred method of cleaning brass and mention in brief several other well-trusted methods. Before you set to cleaning your brass, make certain that what you are cleaning is indeed made of brass. I know this sounds like a no-brainer, but I’m serious. There is a very simple test. First, go to the kitchen and pull a magnet off the fridge. Next, put the magnet on the piece of “brass” in question. If the magnet will not stick to it, you are indeed dealing with brass. If the magnet sticks, there is a good chance that what you have is a piece of brass-plated iron or steel. If this is the case, I would recommend stopping after the next step. Go to the kitchen sink and get to work. Fill the sink with just enough lukewarm water to submerge the brass object in and mix in some gentle liquid dish detergent. 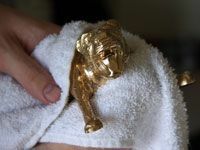 If the object is lacquered or just brass plated and you wish to keep it that way, dip a soft cotton rag into the soap and water, ring it out as well as you can so that it is only slightly damp, and gently wipe the surface clean. If the object is not lacquered, start by soaking it for a few minutes. After a soak, use a cotton rag to wash it. Don’t be afraid to apply a little pressure. Use a soft bristled toothbrush to get in the cracks and detailing. After you’re done, have a look at it. If that did the trick, you can skip the next few steps. 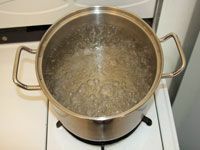 In a non-aluminum pot, boil water with a couple teaspoons each of baking soda and washing soda. Do this only if your brass is lacquered and you need to remove it. Very often the lacquer on brass wears off or becomes cracked. When this happens, the brass is exposed to the air, becomes oxidized, and thus tarnish is born. There are two methods for boiling your brass. First, boil the hell out of it until all the lacquer comes off. Otherwise, submerge the brass object in the boiling water for a few minutes and then remove it carefully. When the brass heats up, it expands; as it cools, it shrinks again but the layer of lacquer does not. You should be able to peel the lacquer away in chunks. Create your own brass polish. This is a ridiculously easy process. First, find a lemon. Great. Now cut it in half, dig out the seeds and squeeze all the juice out of it and into a bowl. Next, find yourself some table salt or baking soda. Doesn’t matter which; either will work fine. Slowly stir the salt or soda into the lemon juice until a paste consistency is reached. Now that you have your brass cleaner, use a soft cotton cloth to apply it to the brass. Using the same rag, going with the grain of the metal, work it gently into the brass to remove tarnish. Salt and soda act as a light abrasive, so don’t push too hard. If you’re really concerned, or the item is brass plated, just go with the lemon juice and skip the salt/soda. Use a soft-bristled toothbrush to clean the crevices. Make sure you removed all the tarnish and get your brass good and dry. Once the brass polishing procedure is completed, rinse away all the lemon-flavored brass polish. Take a good look at your work. If you find some spots that you missed, just go ahead and hit them with some of your leftover brass cleaner. Be sure to rinse again. When you are certain you’re done, get a clean cotton cloth and dry the brass as quickly and as well as you can. Brass retains water spots something terrible. Using a new and totally dry cotton towel, or better yet, a microfiber cloth, buff your brass ’til it shines all purdy-like. Protect your brass and make it shine. Alright, one more step. To help protect your hard work and make it so you don’t have to go through this quite so often, give your brass a little protective barrier. For this, I recommend a little olive oil. Dampen a soft cotton cloth with your olive oil of choice and brush your brass with it. Apply as lightly as possible. I’ve also heard lemon oil works well for this. I prefer oiling to re-lacquering simply because it’s a little more environmentally friendly. Even though lacquer is a natural product if you can find it pure, it’s still quite processed and generally over-packaged. Besides all that, brass is a natural antibacterial. If you lacquer it, that property is diminished. Who knew cleaning brass could be so easy? There are just so many ways to do it safely and naturally without the use of scary chemicals that oftentimes strip away the top layer of metal. That stripping can eventually cause the intricacies of your brass to lose definition. The method outlined above is just my own personal preference. If you are curious about other methods, just have a look down here. The secret ingredient to all of these household brass cleaners is a weak acid with a pH somewhere in the area of 3 to 4. For all of these methods, rinse well and buff with a soft clean cloth or micro fiber cloth. Ketchup! Yeah, baby. I’m talkin’ about good ol’ Sauce Americana. Sounds too good to be true, you say? Oh, yeah. I know. But really, just smear some ketchup all over your dirty brass, let it sit for a few minutes, and wash it off. Worcestershire sauce. It just keeps getting better. Same as with the ketchup: wipe it on, let the acidity of the stuff work its magic, wash it off, and voila! Clean brass. Just be sure to rinse it off really well. It might take a couple of tries. White vinegar and salt. Is there nothing vinegar can’t do? Pour vinegar over your brass and then sprinkle it with salt. It’s supposed to work great. Vinegar can also be used at full strength. Wet a soft cloth with it and wipe down the brass. Yogurt. The lactic acid does the trick. Use a spatula to coat your brass in yogurt. Let it sit long enough for the yogurt to dry, and then buff it off with a soft dry cloth. Rinse the heck out of it. Turns out dairy products stink when they sit out too long. Milk and water. Speaking of lactic acid, you can simmer your tarnished brass in a 50/50 solution of milk and water. Simmering times will vary depending on the extent of tarnish. Again, make sure to rinse it off really well, as rotten milk stinks. More lemons (or limes). If the piece of brass being polished is not very intricate, it works well to simply cut a lemon or lime in half, sprinkle some salt or baking soda on the sliced end, and rub the brass with it. You may need to reapply the salt/soda. Rub with the grain of the metal. Q2 Brass Cleaner is an effective and eco-friendly brass cleaner, and it has a great reputation. It’s manufactured in the UK and is kind of difficult to find in the US, but money is money and those UK folks will ship the stuff anywhere. 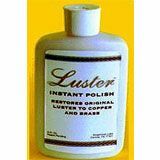 Luster Copper/Brass Cleaner, on the other hand, is fairly easy to find in the US. 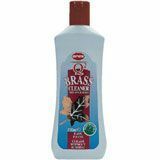 It too is an environmentally friendly brass cleaner and uses no petroleum distillates. Its non-scratch formula restores shine to brass almost instantly. 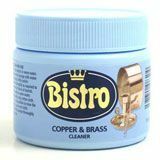 Bistro Copper and Brass Cleaner is intended for use on brass and copper kitchen utensils. It uses a super fine abrasive that is good at cutting through the tarnish without scratching your pots and pans. You can find Bistro cleaner from Amazon.